Cashback excludes store credits, Lazada branded gift cards, gold bars, tax, delivery & service charges. (App Only) Lazada Deal: New Customers Exclusive - RM5 off with ShopBack Exclusive Code "SBAPR19". Min spend RM50. Promotion ends 29 April 2019. Take RM5 off your first purchase on Lazada with Code SBAPR19. RM50 minimum spend required. Exclusive for New Customers. Enjoy up to 80% off on Mobile products with Lazada Promo voucher! Grab 80% discount on mobile electronic deals on Lazada Malaysia plus get cashback on all purchases! Valid for all customers. No promo code needed. Best Global discounts Up to 80% discount on Lazada! Shop for smartwatches, speakers, headphones, computer and mobile accessories and get up to 80% OFF plus cashback! Look for Lazada Voucher Codes to save more! Buy Bed Mattresses from RM499 when you shop on Lazada! Use coupon to Avail. Order your next KBeauty Cosmetics with 10% discount on Lazada and get FREE Klairs Minimalist for any order! Cashback available on checkout. Terms and Conditions Apply. Lazada Promo: Scarf Sale with Up to 70% discount! Use Coupon to Avail Cashback! Scarf Me Away Promo is here! Giving Up to 70% OFF on All Deals!. Items for as low as RM14. No Promo Code Needed. Buy electronic giants like refrigerators, washing machines, air conditioners, oven toasters and more of these kind of appliances on Lazada Malaysia now! Get 60% on items plus cashback! [App Only] Lazada Deal: Fashion, Lifestyle, Electronics & more at the best prices! 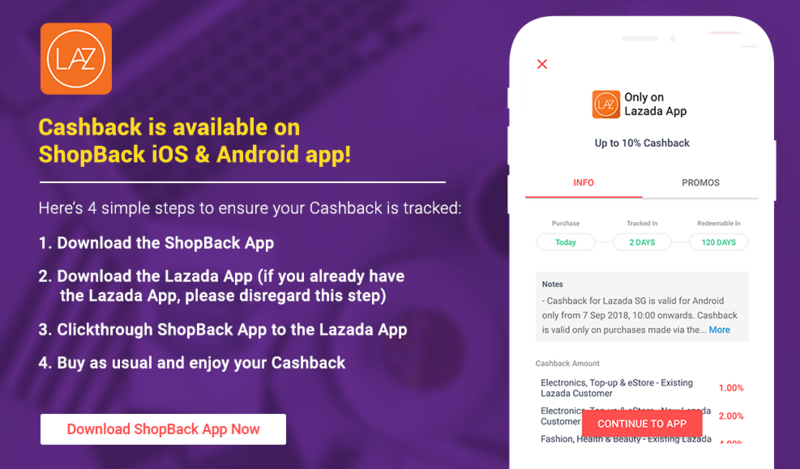 To ensure your Cashback is tracked, please install the Lazada App before clicking through ShopBack. If you’ve just installed the Lazada App, please clickthrough ShopBack again to shop on the Lazada App. Catch great savings with Lazada Vouchers and Sales at ShopBack Malaysia! Featuring goods at insanely low prices, Lazada’s best deals will ensure you get what you need without breaking the bank. Be sure to check the Lazada Malaysia site regularly, as it offers great sales. From day to day, the shopping site has top sales up to 80% off all its products, so you will never know what kind of awesome deals you can get from Lazada. Items often sell fast, so be sure to check regularly. Grab a simple SD card to a full HD LED television; the Best Deals section has a short summary of the unbeatable deals of the day. ShopBack gives you up to 10% cashback for all your Lazada purchases on top of the awesome savings from coupons and Lazada vouchers, so be sure to shop with ShopBack Malaysia! Some similar services in the cashback site are Shopee, Qoo10 and Taobao. Lazada Malaysia is the top one-stop online shopping boutique in the region. To help you enjoy the best savings, we at ShopBack have collated a list of the promos and discount vouchers for you. The coupons offered here is consistently updated by a team of dedicated ShopBack workers, giving you maximum savings for your shopping. What's more, receive up to 11% cashback by shopping with ShopBack Malaysia, so get additional savings on top of Lazada's spectacular sales. Be it electronics, kitchen appliances, fashion pieces, beauty products or travel items, Lazada is your one-stop shop for all your needs. It is poised to change the way people shop, with its endless array of items online and speedy delivery services. With a few simple clicks, you will be able to get your products delivered to your home, allowing you to shop even without stepping one step out of the house. With thousands of products in store, it surely provides a one-stop site to get sorts of equipment, ensuring that you will not have to visit individual stores to purchase your items. By operating online, Lazada also removes physical operating costs, to give you the best value for your money. With a few simple clicks, get your items sent right to your doorstep. Electronics: Lazada offers a wide variety of mobile phones, tablets, cameras, laptops, computers, just to name a few. With many popular brands such as Razer, Apple, Benq, you will definitely be able to find the products you want. Grab the exclusive 11.11 vouchers to get great savings on all your electronics purchases. Fashion: The company has recently expanded its product range to include fashion and beauty products. There is a large array of bags, clothes, shoes and accessories available. Lazada carries top major fashion brands such as Fossil and Giogio Armani alongside smaller niche brands including UNISA and GMP. Lazada often holds great fashion sales, so get huge savings on your fashion purchases with up to 91% off fashion items. They also has a 14 day free return policy for all your clothes to guarantee your satisfaction. Home appliances: Lazada also offers a large range of home appliances for your convenience. You can get televisions, microwaves, kettles, and even fridges, so you can beautify your home even without stepping out of the house. Toys and Baby products: To all the young mums and dads-to-be, this online shopping site also carries a line of baby products including push prams, breast pumps, sterilizers, and booster seats. So don’t worry if you don’t have the time to go shopping, just go online to Lazada and purchase your baby products today and keep your young ones entertained. Also available are children’s toys and educational tools to let them enjoy a healthy, fun and safe childhood. Travel: If you are looking to travel overseas, the website has a specific category dedicated to fulfilling all your travel needs. Selling luggage, locks, backpacks and even camp gear, Lazada has all you need for any type of holiday to anywhere, making your pre-trip painless and effortless. Have fun without all the pre-trip worries, and get great savings! Beauty products: Lazada also sells all sorts of beauty and health products to make you feel good about yourselves from inside to out. From makeup products to food supplements, they have a wide range of products to make you look and feel better about yourselves. Make use of exclusive coupons to get the best deals for your purchases. Sports: For those looking to keep fit, Lazada has a series of sports gears to help you keep in shape. Check out the cross-trainers, dumbbells and weights available on Lazada, and plan out your fitness plan. Get in shape and get healthy! To maximise your shopping experience, the website keeps its interface clean simple and easy to use, so enjoy shopping with Lazada Malaysia today! Avid shoppers will be glad to know that Lazada offers free shipping services for orders over RM80. You will be able to sit in your own chair, click through all the possible products you have in mind and compare all their technical specifications or get recommendations from fellow online shoppers, then decide on the product you want for your home. Download the Lazada Mobile App for both Andriod and iOS phones. With this easy-to-use app, you can shop items on Lazada conveniently. Be sure to get the Lazada android app installed on your phone now to enjoy safe and secure shopping now. Downloading the app gives you cashback from ShopBack Malaysia. So download it now and save on your purchases! It's so easy to shop with the app, you can do it anywhere - on the train, or a bus. There's no need for a desktop anymore when shopping with Lazada mobile app. You can browse and search by category and brand using the Lazada app. Also, you can sort items by filters and add them on the wish list creator on the fantastic Lazada app!